Imagine what your mouth would feel like if you never brushed your teeth or went to the dentist. For many dogs and cats, this is a painful reality. According to the American Veterinary Dental Society, more than 80% of dogs and 70% of cats have dental disease by the age of 3. 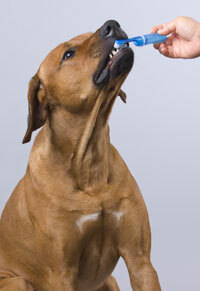 Dental (or periodontal) disease is the most frequently diagnosed health problem in pets. Even if your dog or cat doesn’t have these symptoms, we recommend that you have a veterinarian evaluate your pet’s dental health at least once a year. Bacteria and food debris accumulate around the teeth and, if left unchecked, will lead to deterioration of the soft tissue and bone surrounding the teeth. This decay can result in irreversible periodontal disease, tooth loss, and possibly expensive oral surgery. Dental disease can also affect other organs in the body: Bacteria in the mouth can get into the bloodstream and cause serious infections in the kidneys, liver, lungs, and heart. If these problems aren’t caught and treated quickly enough, they can result in death. A physical exam combined with appropriate laboratory work can determine if infection in the mouth has spread. Schedule your pet’s dental exam today! We can also show you how to brush your pet’s teeth and recommend foods and treats that will help combat plaque and tartar buildup. Welcome to Mount Joy Animal Clinic! Your local veterinarian in Markham. We’re proud to provide a wide variety of veterinary medical services for cats, dogs and small animals in Markham & surrounding areas! © 2019 Mount Joy Animal Clinic.